Replacing Adventures of the Red Mask on January 11 1937, Adventures of Nervy Nerts stuck with exotic locales like its predecessor, but was playing for laughs rather than thrills. Nervy Nerts entered the section with a real bang. Our hero was launched like a missile each week from one crazy predicament to another. He was spit out of a volcano, launched off a mountain by a goat, hit by a train, thrown from a plane, and so on. It was the most frenetic strip debut I've ever seen. I mean, has it ever been said that a strip slowed down considerably when the star finally landed on a cannibal island? The strip was credited to George Scott, a cartoonist neither Alex Jay or I can vouch for actually existing. I wonder if this is the same cartoonist who went by the name George West on Adventures of the Red Mask? Certainly the styles differ, but one strip was adventure and this one is humor, so that's to be expected.The strips share so much in common -- titling, cartoonist first name, manner of credit, that on microfilm where I originally did my research I did not even catch that the credit name changed between the two strips. 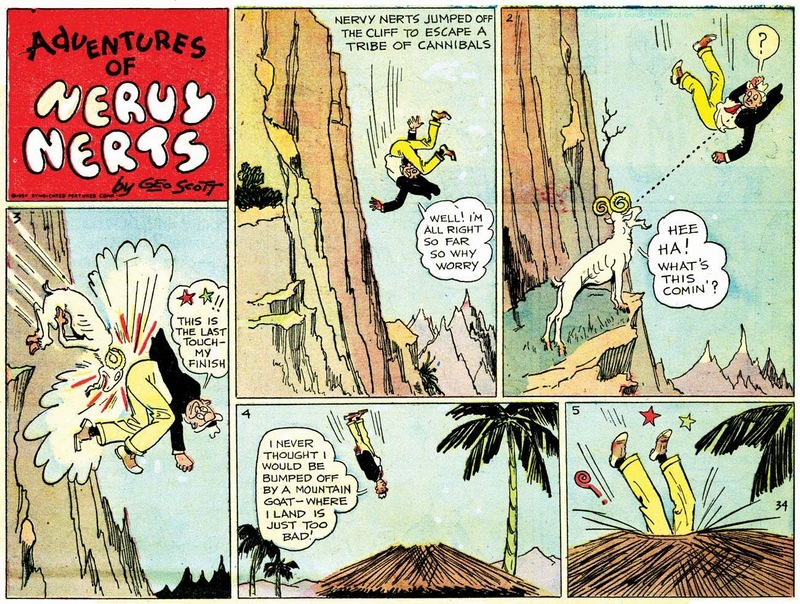 In my book you'll find Adventures of Nervy Nerts improperly credited to George West. Sorry about that! 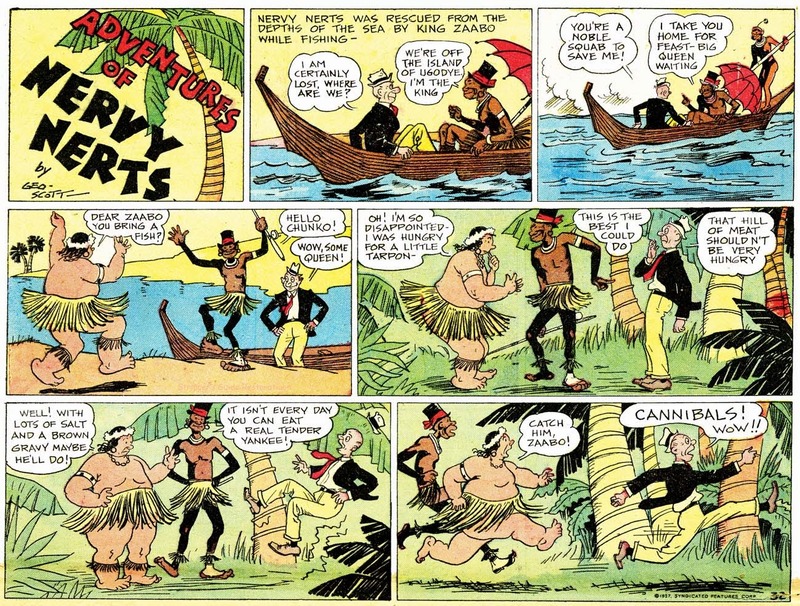 This fun strip, the only one that didn't start when the section itself debuted, ended on the demise of the Syndicated Features section on March 8 1937. Is the relationship between Zaabo and the Queen comics' first interracial marriage? Progressive indeed. I see another similarity between the work of West and Scott: the pacing is similar. It’s especially noticeable between episodes—there’s a sense that something happened between the two Sunday installments. In this case, Scott skips the actual fall, going from our hero running to falling. Make that “the actual jump”.